Johann Fabricius was a prolific describer of new insect species, and he named about 234 species of scarab beetles. In 1762 he went to Uppsala to study under Linné and traveled extensively in Europe to collect insects and study collections. In 1769 he returned to Copenhagen where he became a professor extraordinarius at the University. He spent his winters of the next few years in Copenhagen and the summers in London where he worked on the collections of Banks, Hunter, and Drury. He published his Systema Entomologicae in 1775, the main part of which was based on his own collecting in England and the collections in England. 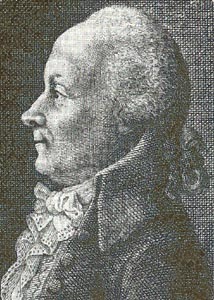 He accepted a professorship of natural history and economics at the University of Kiel in 1771. Again, he spent the winters in Kiel and the summers in Paris or London. While in Paris, his associates were Cuvier, Lamark, Latreille, Geoffroy, and Olivier. Genera Insectorum was published in 1776; Species Insectorum in 1781; Mantissa Insectorum in 1787; and his main work, Entomologicae Systematica I-IV, was published in 1792-1794 followed by Supplementum Entomologiae Systematicae in 1798. From 1801 until his death he continued to publish his monographs on the larger insect orders. In the Autumn of 1806 Fabricius returned for the last time from Paris to Kiel where he died on 3 March 1808. Zimsen, E. 1964. The Type Material of I. C. Fabricius. Munksgaard, Copenhagen.